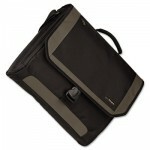 CityGear Miami Messenger Notebook Case Sporty, lightweight case is packed with features. Zip-down workstation includes accessory storage, PDA pocket, pen loops, business card holder and key clip to keep essentials in easy reach. Padded compartment protects notebooks with up to 17″ screen. Side hidden water bottle pocket and zippered front pocket for tickets or passport and rear slip pocket. Includes padded shoulder strap and luggage strap for secure attachment to rolling travel case. Manufacturer’s limited lifetime warranty. Sporty, lightweight nylon case is packed with features. Zip-down workstation includes accessory storage, PDA pocket, pen loops, business card holder and key clip to keep essentials in easy reach. 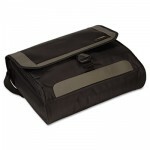 Padded compartment protects laptops up to 17.3″. Removable mobile phone pouch, side hidden water bottle pocket, zippered front pocket for tickets or passport and rear slip pocket. Includes padded shoulder strap and luggage strap for secure attachment to rolling travel case.